A couple of weekends ago I made a trip home to my parents’ house for my brother Nick’s annual birthday wine tasting. Since I’ve bragged to you about how great they are before I thought that this time around I would shake it up. Instead of a recap I’ve decided to bring you, dear reader, into the tradition. Hosting your own wine tasting is simple and fun. Here are four tips to get you started. One of the signature events of the Wine Bloggers Conference (WBC) is something called live wine blogging. Let me tell you – it was INTENSE. There were two sessions – one for whites and another for reds – and in each session winemakers and wine reps toured around to different tables of bloggers and writers pouring their wine and talking about it. The part where I got to taste new wines and learn something interesting about the maker or the wine or the brand spoke to my little wine-nerd heart. The intense part? We only have five minutes per wine to taste, listen, make notes and, in my case, send out a tweet. Some bloggers took notes to create content later but I wanted to show some immediate appreciate for these wines and their makers. Plus I was excited by the challenge to come up with quality content that quickly. It’s time for the next instalment of the Noble Grape Challenge. Last time we got to know Semillon, and this time around we get to know possibly my favourite white wine, Viognier. I’m going to out on a limb and say you’re probably not that familiar with Viognier. Let’s start with figuring out how it’s pronounced, shall we? It’s vee-on-yay, or sometimes vee-own-yay, and definitely not ‘von-yay’ like I thought it was called. Oops. Basically, it’s French, so just pretend the g doesn’t exist. I was at home over the Easter weekend and this year it happened to coincide with my brother Nick’s birthday. For the past few years he’s requested a wine tasting from my parents as part of his celebrations and, wonderful parents that they are, they’ve obliged. The world keeps spinning, the seasons keep changing, and while there hasn’t been much activity here of late, my own personal wine adventures continue. A few weeks ago I wrote a 50 multiple choice question exam that was the culmination of four months of learning about wine. For 16 thoroughly enjoyable weeks I systematically learned about wine and spirits. To my delight we learned (and tasted!) our way through Chardonnay, Pinot Noir, Sauvignon Blanc, Cabernet Sauvignon, Merlot, Riesling, Syrah, Grenache and a whole mess of other whites and reds. We also got comfy with sweet, sparkling, and dessert wines (Sherry is amazing, and you will probably hear all about it in a future post), and had one class each on white spirits (vodka, gin, etc.) and brown spirits (the whiskies, mostly). Delicious and exhausting, looking back on it. After freaking out over my seeming lack of ability to retain anything about things like the varietals specific to Italy or Vins du Naturels, I hunkered down with some charts and index cards because I decided I would be damned if I wasn’t going to pass this test with flying colours! My aim was to pass with distinction – 85% or higher. But let me tell you – it is really difficult to get 85% or higher on a 50-question test, each question was worth 2%! If I got any more than seven questions wrong that dream would go out the window. Well, I found out last week that while I did pass, it wasn’t with distinction. On the plus side, it was with merit (80-85%) – I’ll take it! My brother Nick’s birthday was in April and he requested a wine tasting as part of his celebrations. Of course we, his loving family, were happy to oblige. We tasted six reds and six different varietals. I’m sad to report that I only correctly identified two of the six wines – it’s clear I still have some work to do. However, it was still a great time and we were treated to six really delicious wines from my stepdad’s cellar. Alas, I only correctly guessed two out of six wines. Aaaaaaaaaand then my stepdad spoiled us all even further by opening this wine. Holy crap, this wine is old! 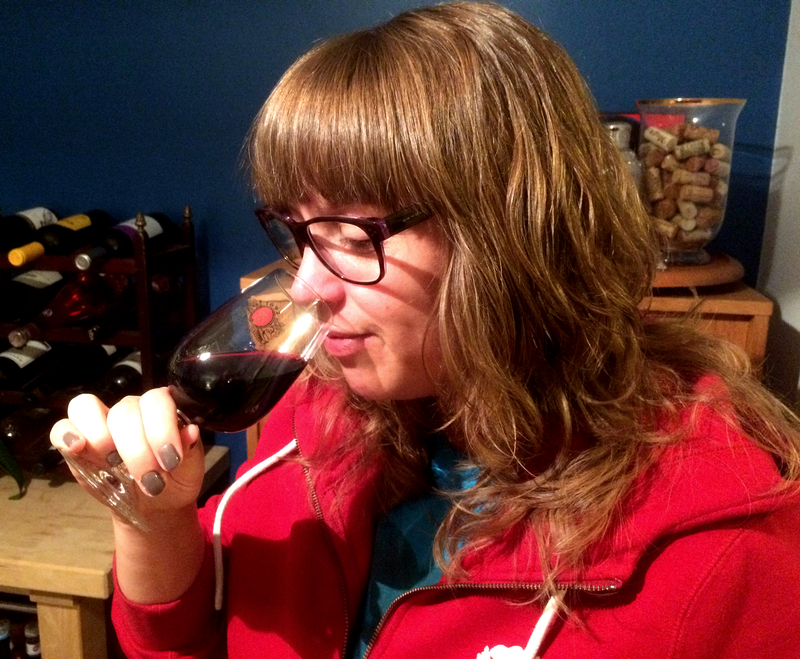 I’ve been making a concerted effort lately to catalogue the wines I drink in Vivino. My plan is simple – every time I taste a new wine I log it in the app along with some brief tasting notes. I don’t usually re-log the same wine, so the wines in my profile are usually ones I’ve never had before. I’ve also been focusing on wines I have in my day-to-day explorations – taking time out at dinners or parties is a bit more onerous that I’m interested in, and I know I have ample opportunity to log wines independent of social time. To date I’ve logged 82 wines and am ranked 188 in Canada. Pretty cool! If you like you can follow me there. I’ve always been a bit of a nerd for formalized education, and my WSET Level 2 course was so enjoyable that even before the course ended I knew I wanted to keep learning about wine in this way. I also made a couple friends from that class and together we’ve decided to go on to the Level 3 course in January. In the meantime I’m going to fill in some personal gaps by taking a different wine course through a local college. Both my wine buddies have taken this one and recommend it before doing WSET Level 3 since the jump from Level 2 is quite big. To be honest I have no problem with this; more classes and tastings – hurt me! Now that spring feels here to stay I’m looking forward to the warmer weather, which of course includes more whites, more rosés and fun with sangria. A few weekends ago I headed to Niagara to see some friends and, of course, taste some wine. I had the immense pleasure of partnering with the Cool Climate Oenology and Viticulture Institute to attend their event called Cuvée en Route. For $30* you get free tastings at over 30 wineries in the area. Many wineries also take the opportunity to bring out special releases or showcase new or unique wines. We worked hard in our one day ‘en route’, making it to nine (yes, you read that right, NINE!) wineries. The nine wineries we went to could not have been more different. Other than being located in Niagara and housing a lot of fermented grape juice, I mean. Here’s a run-down of the places we had the pleasure of visiting. Their tasting room and shop are in an old converted farmhouse, making it feel very soft and welcoming. We sat at a lovely high-top table and sampled the three wines they chose to share. While tasting the man helping us helpfully explained the wines, including what the weather was like the year the grapes were grown and what he personally likes to pair each wine with. It’s always a pleasure to have someone take the time to share their knowledge and passion with you. Highlight: Their 2014 Chardonnay. Toast, oak and stone fruit – it’s a great example of a California style Chard. Highlight: Their 2013 Chardonnay Recioto. With green fruit and apple blossoms, it is entirely different from any other Chardonnay I’ve tasted. Pretty artwork on the labels, no? This is a winery I was not at all familiar with before this tasting. What I didn’t know is that this winery was started by a former ambassador who was posted to Italy with his family. He fell in love with wine there and when he retired from that life he knew that what he wanted to do most was start a winery in Niagara using Italian wine styles, and I’m so glad he did. Using appassimento styles (where you let the grape dry before fermenting into wine), Foreign Affair brings some great wines to the Niagara scene. Highlight: Their 2010 Chardonnay (that’s three in a row for those of you keeping track at home! ), which has lovely creaminess on the nose and delicious tropical fruit on the palate (pineapple and mango stood out for me). The age has helped it mellow a bit too, which I loved. Glasses as big as your head! Oh, Megalomaniac. I know it’s their brand to be all brash and bombastic, but I really just wanted to tell them to calm down! The winery sits on the stop of a big hill, overlooking a great swath of Niagara, and definitely drives home to the bigness (is that even a word?) and confidence that their brand is all about. I thought the service could have been better – it felt like their staff weren’t even briefed on the event, and the wine could have been more mellow. Highlight: Of the three wines we tasted I liked their ‘Big Mouth’ Merlot best. It had the red and black fruit and velvety smoothness I expect from a Merlot but also had a nice full body that I always want but don’t often get from that grape. This visit was a pleasant surprise! For the event they offered a vertical of their Foch wine. If you’re not familiar with this grape don’t worry, I wasn’t either. It turns out that when the winery first started in the mid 1990’s they decided to create a hybrid grape that would better suit the Niagara climate, especially since they were having a tough time getting other more well-known grapes to produce quality yields. Basically Malivoire pioneered a varietal made specifically for the Niagara region – cool! Highlight: Definitely the 2005 Old Vines Foch. Mellow and slinky, but still retaining the red fruit and oaky characters. Plus, how often do you get to drink ten year old wine? Thanks Cuvée en Route! Wine right from the tank at Kacaba. Cool! I’d had Kacaba’s wines before this event but, for some reason, they’re never a stand out favourite for me when it comes to Niagara wines. This visit reminded me that I should pay this winery more attention. Located in a small building that looks more like a cottage than a winery, I had a great time hearing about the (surprisingly large) variety of wines they make there. It also doesn’t hurt that the Kacaba staff person who was helping us was so enthusiastic about the wine and let me talk his ear off with my questions about their techniques and barrelling choices. Highlight: Oh my, their 2015 Sparkling Brut! Floral and fruity with lots of tiny bubbles and a gorgeous blush colour. Delicious! Meet Brix, the resident pooch at Sue-Ann Staff. Yet another example of the uniqueness of each winery in this region. I’m pretty sure the tasting room for this winery is run out of Sue-Ann Staff’s own house (!!) which gives everything a lovely, comfortable, homey vibe – the adorable dog hanging around out front didn’t hurt either. We had a great time chatting and tasting with both Sue-Ann herself. Highlight: Their 2013 Sparkling Riesling was so interesting, with a brightness on the palate but also caramel, burnt sugar and toffee notes and I would guess come from the wine’s age. Henry of Pelham’s classy tasting room entrance. A multi-building outfit, it’s sprawling but compact property made me think of the few California wineries I managed to get to last summer, with its wood and stone work. The tasting room was in a very cozy low-ceilinged room with wooden beams and soft lighting – exactly my kind of room. I kind of wish they had a big puffy chair and a fireplace for ultimate wine warmth. Highlight: We tasted three Merlots – 1998, 1999 and 2000. The 2000 still tasted a bit bright and fruity and the 1998 tasted a little thin, like it was the beginning of the end for the wine’s life. THe 1999, however, was a perfect middle ground with both lively fruitiness and the mellowness I was hoping for. A trio of Cab Francs to end the day. Last but not least, we finished our day with a Cabernet Franc vertical at Peller. To be honest, at this point in the day both my brain and my tongue were getting a little tired so I don’t have as much to say about these wines. Our tasting took place in a stately wood-paneled room on the second story of their building. While their wines are always solid I do usually find myself wishing there was more personality in the Peller experience. Highlight: Of the three years we tasted (2011, 2012, 2013) I liked the 2012 best. It had the expected red fruit and smoke on the nose but also had some cigar box character that I found really interesting. The flavour was similar with some spiciness giving it a solid backbone. Yum! I do love Nagara Cab Francs. Notable omissions include Cave Spring, Fielding, and Organized Crime (which didn’t even take part in the event this year). Oh well. They’re some of my favourites – I’m sure I’ll be back. I also would have liked to have visited Strewn, Stratus and Peninsula Ridge, none of which I’ve been to before. Clearly this calls for another visit. If you’re interested (and for whatever they’re worth! ), I’ve written up my tasting notes in their entirety over on Google Drive. *Or, in my case, complementary with the understanding that I’d write here about the trip. I’ve talked in the past about how to taste wine in general, but it recently occurred to me that I haven’t talked about how I, specifically, go about tasting a new wine. I should preface this by saying that this isn’t how I taste wine every time I open a bottle. There are definitely some days where I come home from work, pour myself a glass, and turn my brain off as I laze back on the couch, happy that the day is over. In those instances the wine is merely there as a delicious cherry on top of a relaxing, television-filled evening. I mean cake. Or something. But when I am being intentional about my wine, when I really want to get to know it, this is how I taste. I don’t usually pair food with the wine. Some might think this is an error, but when I’m meeting a wine for the first time I want to meet just the wine, not how the wine affects or is affected by food. It’s like meeting a blind date – I want to know how they act around me before getting to know how they act at a party. I’m usually alone. Sad, I know! There are many people in my life who share my love of wine, but I can’t always find someone to sample a new bottle with me on a random Tuesday night. I usually do it at home, on the couch, in front of the tv, with my macbook in front of me, jotting down anything that comes to mind as I sip, sniff and swirl. I start by looking at the colour. I love wines that are so dark they become opaque, and ones that take on a purpleish tone – Malbecs and Carménères from Chile and Argentina often look like this. Then I give the wine a good sniff. Often when I’m tasting I’ve just opened a bottle so getting something off the nose is a challenge for me. I often feel like I should pour the glass and let it sit for a bit, but in all honesty I’m an incredibly impatient person and can’t usually resist starting the process once the wine is poured and sitting next to me. Next, and FINALLY, I get to taste it! I alternate between taking quick sips and long ones because the flavour can change depending on the two. While sipping I think about and try to discern the differences in flavour depending on where on my tongue the wine is hitting. I also pay attention to the flavour I’m left with as I swallow (the finish) and how lingering the wine is once it’s gone. I love when a wine stays with you! Let’s be real. Some days I can’t get past ‘yep, tastes like wine’. And actually, I read an article recently that mentioned a study where they concluded that you can’t really taste more than three or four things in one go. I don’t know about you, but that makes me feel MUCH better about times when I’m able to get much off a wine. I try to be methodical about tasting, mostly because I get a kick out of that process and am genuinely interested in the world of wine, with all its complications and vagaries. I’m nowhere near these guys though, they take tasting to a whole other level. Underripe green mango? Crushed hillside?? FRESHLY OPENED CAN OF TENNIS BALLS?! COME ON!! No, I fully acknowledge that the only real question worth asking is – do I like it? The rest is simply learning ways of learning whether you do/don’t or will/won’t like a wine. So really, it’s not that complicated after all. 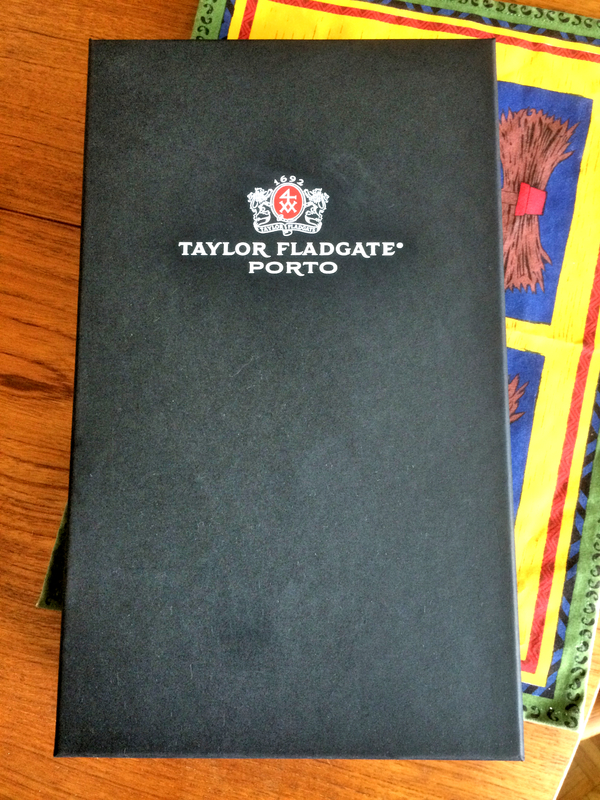 Last Christmas my parents gave me a great gift – a gift set of a bottle of Taylor Fladgate Late Vintage Bottled port complete with two lovely little glasses. Fast forward to this past weekend, when I was tidying up the bar area in my apartment and was faced with the same gift box, sad and a little dusty, patiently waiting for me to give it my attention. Confession time. I am a hoarder of things I love. The more I like or appreciate something, especially gifts, the more I put off enjoying it. I am a nut for anticipation apparently! Friends make fun of me for being able to resist the sweets in my cupboard for months and months, sometimes to the point that they go bad and have to be let go. And the ultimate case in point is this lovely gift that I’ve ignored for months. Sorry, Mom! But no more. 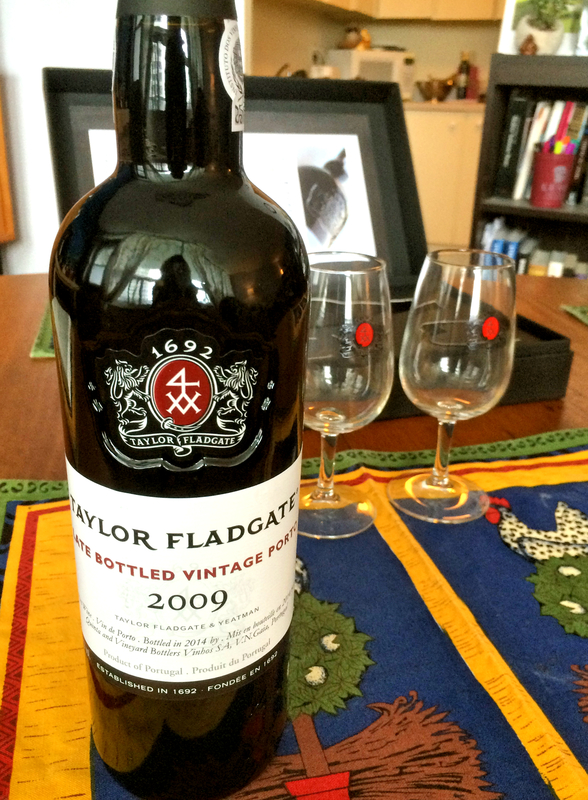 I finally opened the box up and enjoyed its contents, a bottle of Taylor Fladgate 2009 Late Bottled Vintage port. 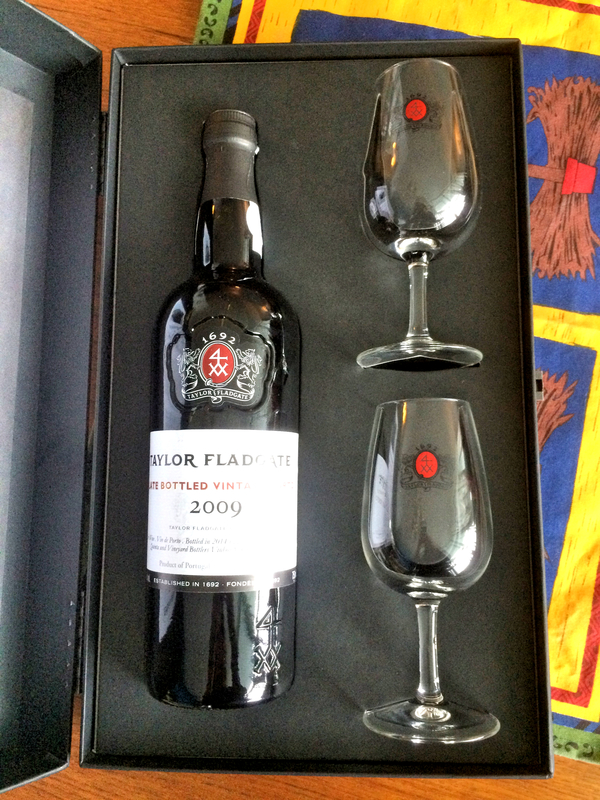 Port is a fortified wine made in Portugal, mostly the Douro region. It comes in both red and white varieties and, like a lot of European countries, is often a blend of a bunch of different grapes. Port is higher in alcohol content so the serving size is 3 ounces instead of the standard 5 ounces usually poured for wine. Port is often aged for a period of time in barrels before being bottled and sold. Personally, I find that port often has a richer flavour and body compared to regular wines, which is a big reason why I love it. Heads up though, it can be sweeter than regular wines, so keep that in mind when trying out this delicious nectar. Late Bottled Vintage port has its beginning as port that was barrelled with the intention of being bottled as vintage port but because of a lack of demand it was left in barrels even longer. Poor sad port, all alone in its little barrel! I’ll save you! Come hang out with me and we’ll be friends! Delicious, delicious friends. 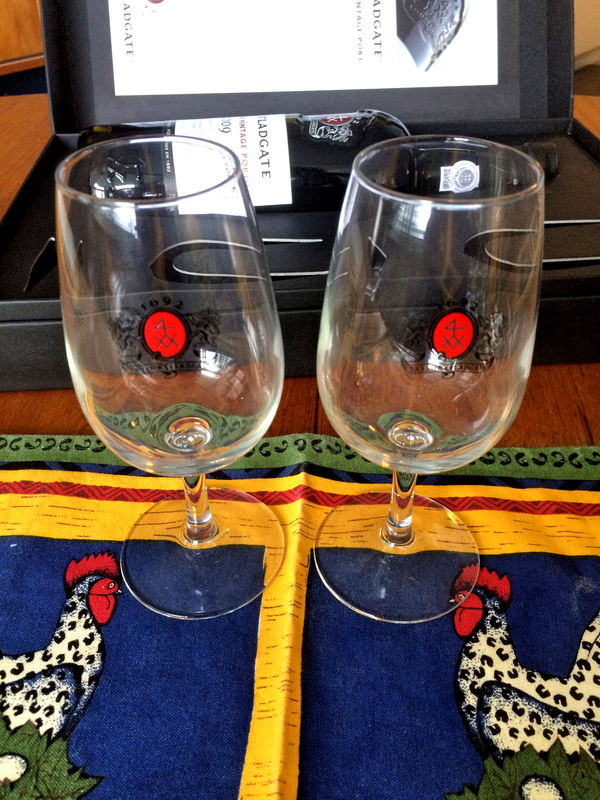 These are typical port glasses. Except these are TF branded, because they’re AWESOME. But enough about history and pictures of unopened bottles. What does this stuff taste like? Well, let me tell you, it’s GOOD. It took a couple of minutes to get anything off the nose because I’d just opened it up, but after that it started giving up some lovely mellow, sweet, warm notes. It’s easy to tell the sweetness in port because the inside of the glass had so many legs it looked like a film coated the whole thing. The flavour was just wonderful. Smooth and fruity with great sweetness and spiciness all mingling on my tongue. If you like mulled wine, pumpkin pie or mincemeat tarts you will love this port. Getting a good smell in! Ready to get to know port yet?